6:00 am: On the move this Saturday morning. Getting ready to head out for run #3. Busy day ahead … 3 rehearsals with three different church choirs (eyein’ my guitar beside me). Finishng up this protein shake, be back later. 7:24 pm: Back from the run. I run at a community college track, at which I arrived at 6:30am. Even at the time there were already folks running and walking, with the parking lot across the street continually filling up. You can’t say these people are not serious about fitness if they are out there at 6:30 am. The temperature was already 76 degrees and the sun was out. I warmed up by walking two brisk laps and people were still coming in. As I hit the second lap, a guy was slow walking ahead of me. There was a woman walking a little faster behind him. As she was about to pass him, he said good morning. At about two paces ahead of him, he says to herDo you come out here often? (oh boy at old man trying to get his mack on). Ha! 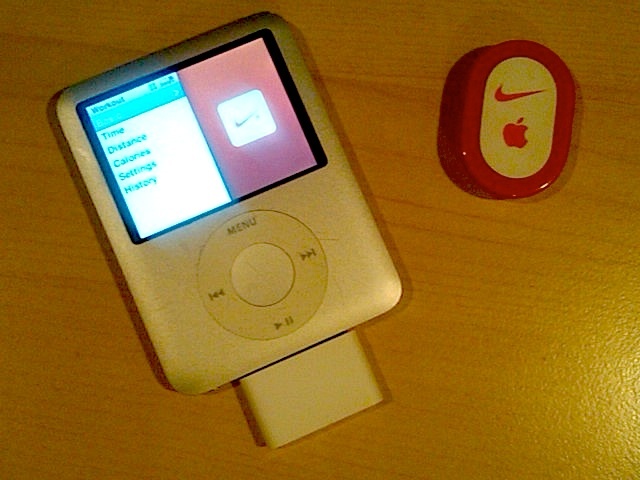 I finish the second lap, stretch the legs, hit the center button on my iPod Nano, and start Nike Plus for the 1 mile run. First lap is good, still trying to get my form right where the stride is easy (daggone shin splint). I brisk walk the second lap, checking my breathing regulation. This run is, so far, better than the 2nd one. Third lap I begin the run, but do only three-quarters. At 6am I had that protein shake, and at the three-quarter mark my stomach was reminding that I only had that shake about 45 min ago. I listened to my body and walked the last quarter lap. I like “Honey” giving me my distance reminders while my workout jams are flowing in my ears. When I hit one mile, “Congratulations, your workout is complete, please hit the menu button to stop the workout” (which I did). I get back to the car after stretching some, and do just a few more calf raises to stretch them and the shin areas out, then head home. Already getting hotter outside, I noticed a low lying, thin fog. It’s supposed to hit the upper 90s again today. On the way home, I’m listening to my playlist and Honey says “Workout activity paused, please hit the center button to resume workout” (Uh oh….grrrr). I let it go, as the Nike Plus screen is not even showing. I get home to check my workout data – none record. Ugh. Buttons and screens, got it right last run, flubbed it this one…oh well. I’ll FINALLY get it correct! Busy day ahead, next run will happen, at best, Sunday evening around 7:30pm.